Henri Petiet, Paris; purchased in 1950 by Lessing Rosenwald, Philadelphia; gift to NGA, 1964. Degas Monotypes. Fogg Art Museum, Cambridge, 1968, no. 1. Nelson Atkins Museum, Kansas City, 1973-1974. Lessing J. Rosenwald, Tribute to a Collector. National Gallery of Art, Washington, 1982., no. 66. Degas: The Dancers, National Gallery of Art, Washington, 1984-1985, no. 17, repro. 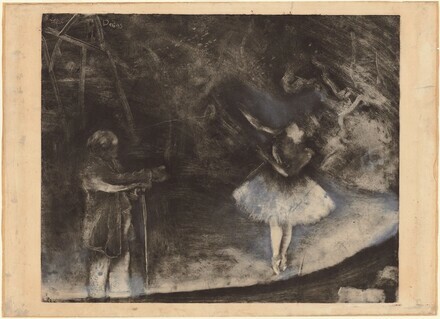 Prints by James McNeill Whistler and His Contemporaries, National Gallery of Art, Washington, 1995, as The Ballet Master by Edgar Degas, executed in collaboration with Ludovic Napoléon Lepic. The Unfinished Print, National Gallery of Art, Washington, 2001, as The Ballet Master by Edgar Degas and Vicomte Ludovic Napoléon Lepic. Degas's Little Dancer. National Gallery of Art, Washington, 2014-2015, brochure, fig. 11. Degas: Impressions, The Museum of Modern Art, 2016. Janis, Eugenia Parry, compiler. Degas Monotypes; essay, catalogue, and checklist. Cambridge: Fogg Art Museum, 1968. Shackelford, George. Degas: The Dancers. Exh. cat. National Gallery of Art, Washington, 1984: no. 17. Boggs, Jean Sutherland, et al. Degas. Exh. cat. Galeries nationales du Grand Palais, Paris; Musée des beaux-arts du Canada, Ottawa; and The Metropolitan Museum of Art, New York, 28-29, fig. 2/10. National Gallery of Art, Washington. Washington, D.C., 1992: 323, repro. Callen, Anthea. The Spectacular Body: Science, Method, and Meaning in the Work of Degas, New Haven and London, 1995: no. 49. Fichner-Rathus, Lois. Understanding Art. 4th ed. Englewood Cliffs, New Jersey, 1995: 118.